Barbara Rodenburg was born in 1969 in the urban area of the West of the Netherlands. Her father is a farmer’s son who became a technical engineer and her mother is a trucker’s daughter who next to being mother and housewife worked part time as typist and receptionist. She studied forestry and nature management and worked as an advisor for a commercial engineering agency and for the Province of Noord-Holland. After that she worked over 7 years for a an alliance of 30 local farmers cooperatives for nature management in agriculture. She has always loved sailing and the sea. Since 1992 she lives on a boat. 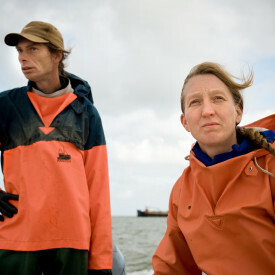 In 1999 she met the artisanal fisherman Jan Geertsema and became a part time fisherman. The couple married in 2002. In 2007 Barbara quit her job for the farmers cooperatives and became a full time fisherman. She has no children. Together with Jan she fully dedicates her life to their small fishing business and the preservation of the traditional small scale fishery of the Waddensea. In that struggle Barbara and Jan see their products as their most important ambassador. Around those products they seeks to build new alliances with consumers and restaurant chefs. Since 2006 the couple has a fish stall at the organic farmers markets in Utrecht on fridays and in Amsterdam on saturdays. To supply the market stall they started a collective of responsible fishermen “Goede Vissers”. They are also selling the fish from themselves and colleagues to a growing number of interested restaurants. Since 2011 Barbara left the market to start her own little fish restaurant at the harbour of Lauwersoog. Every friday, saturday and sunday she now cooks and serves regional fish at her own home port. Monday to thursday are still reserved for the fishing itself.